The wing is a giant finger, and fingers are connected to the radio/ulna pair by several small bones called carpals and metacarpals. I’ll leave the carpals for another opportunity and concentrate on the metacarpal and four phalanges of the wing. 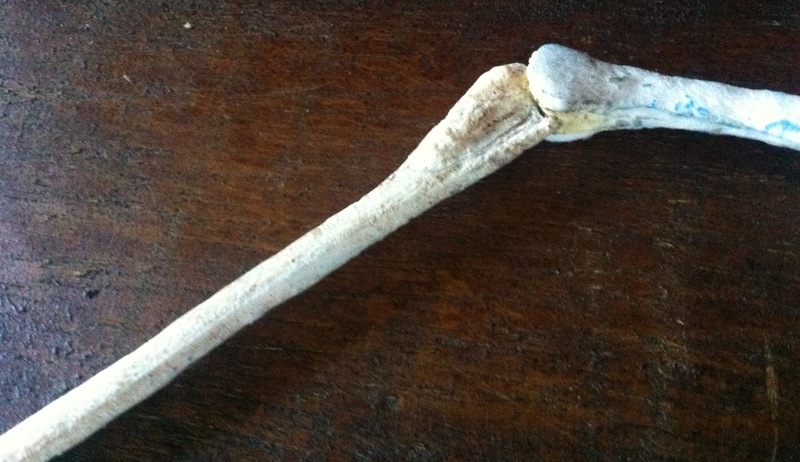 The wing metacarpal is a big bone, about the size of the radius and ulna and even wider on one end. The wider end articulates with the radio-ulna pair through the carpal bones, and the other is a hinge for the first phalange of the wing – the longest bone in the Tapejara body. I used SMNK PAL 1137 as a source, but had to rely on Tupuxuara for some details. They are similar. I got the length dimensions from Brian Andres’s database (scaled 25%). 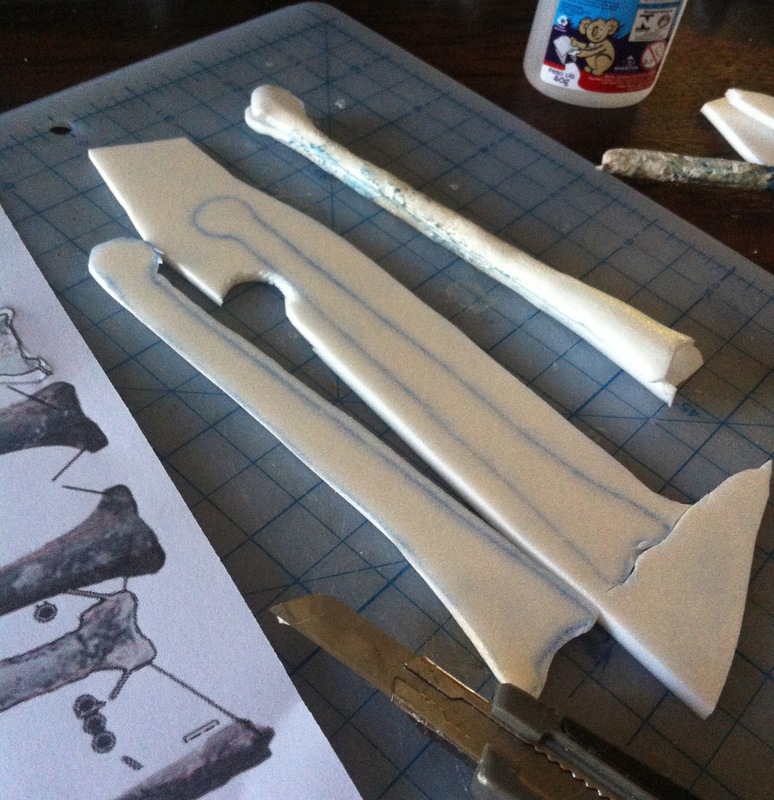 I used the same process I employed on the other long bones. 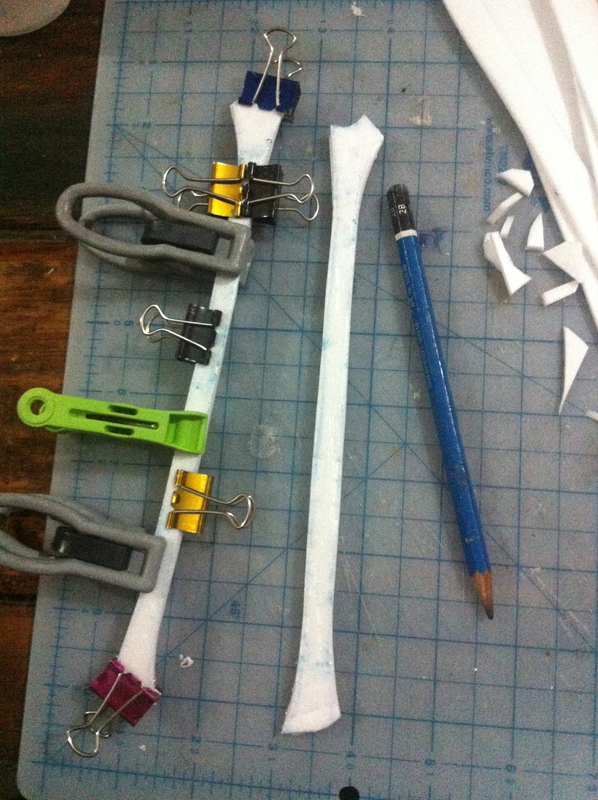 Cut two halves, shape, glue together, fix with fire, add ends in thicker foam and reshape. After the metacarpal comes the long first phalanx. This one I could rely on a picture I have from IMCF 1061 (which was perfect, since the quality of the pictures in SMNK PAL 1137 is very bad). 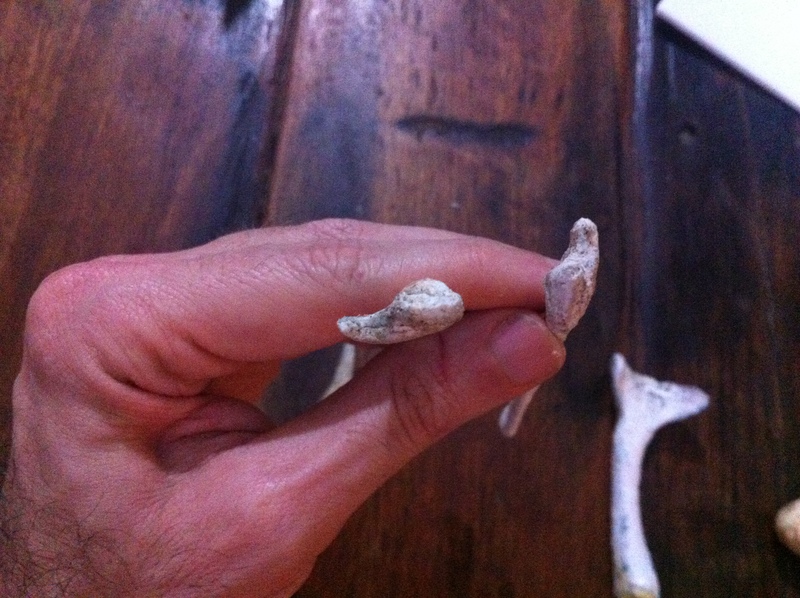 This bone has a flattened shaft, so it has greater resistance to anteroposterior forces than to dorsoventral ones. You can see I added a thin strip of plastic to the middle of the bone. Does that increase resistance? I measured it. A strip of 2mm foam 20 cm long and 7mm wide attached on one end (1cm for attachment) can support 7 grams on the other end before folding (forcing the weak narrower side). Treating it with fire made it resist more, but it cracked with 9 grams. 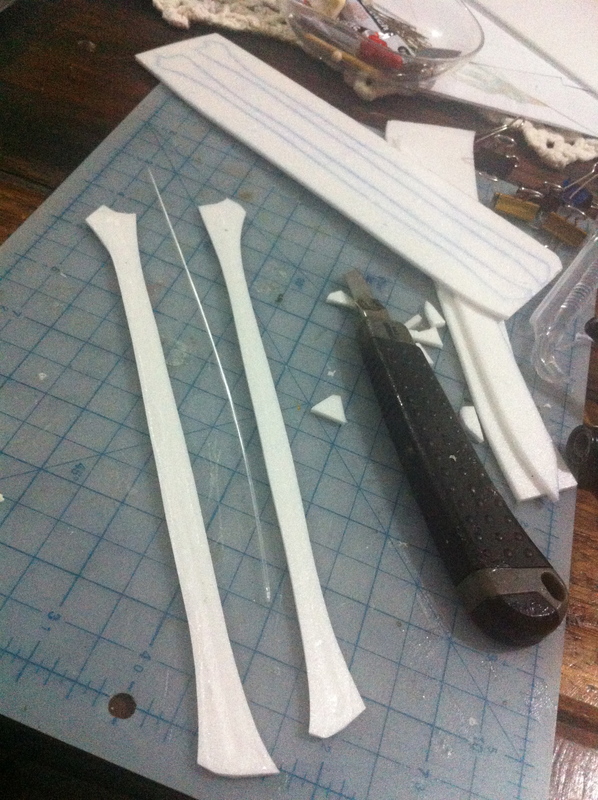 The phalanx has two of these strips, and is a bit hollow (I glue them on the edges, slightly curved). I made a prototype which supported 20 grams before cracking. Adding the strip won’t keep it from bending, but will avoid a destructive bend in one place or cracking. I expect that resistance to increase when I add the acrylic resin, and even more after the epoxy resin coating. 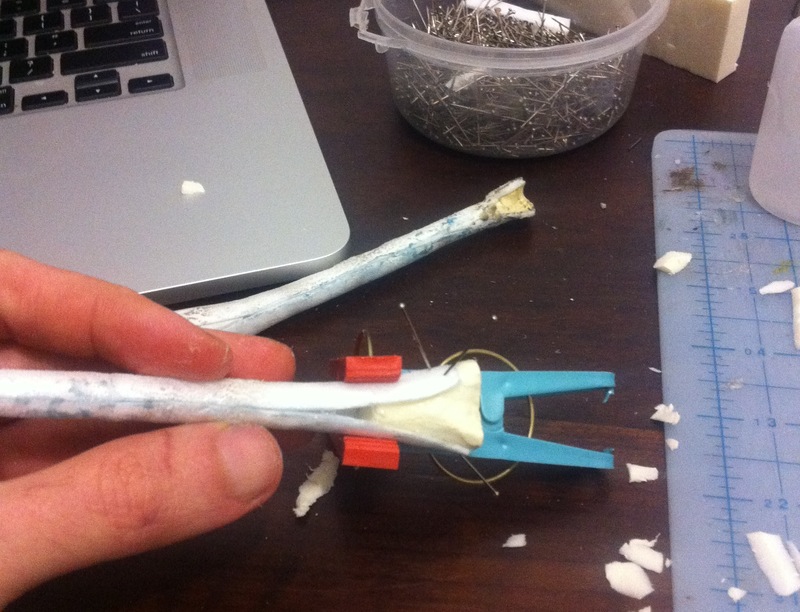 Anyway, the maximum of weight the phalange will have to bear (considering only support on the proximal end) is 7 grams (considering the other three phalanges already coated with resin and epoxy and connected with silicone rubber). They currently weigh less than 5 grams (no epoxy coating yet) and they still have some water from the acrylic resin to evaporate. 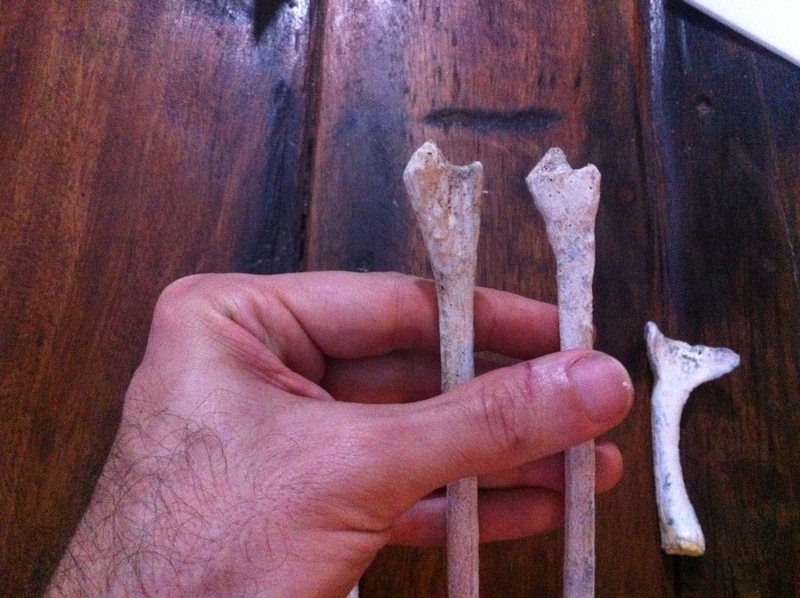 Here are the finished bones of the first phalanx compared to an unfinished humerus and the neurocranium. Some closeups and other angles. Testing the articulation with the metacarpal. 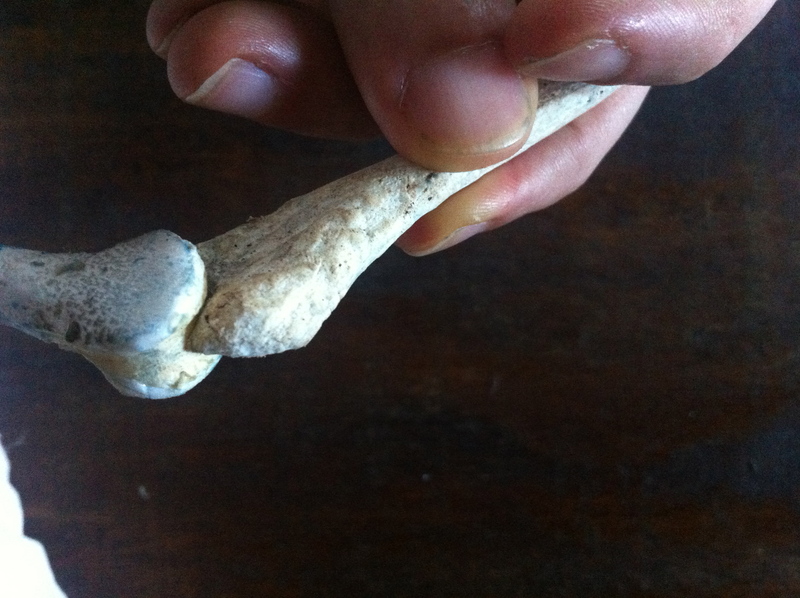 The articulation with the radius-ulna pair is still not possible because there are yet no carpals. Next step: the other three phalanges. 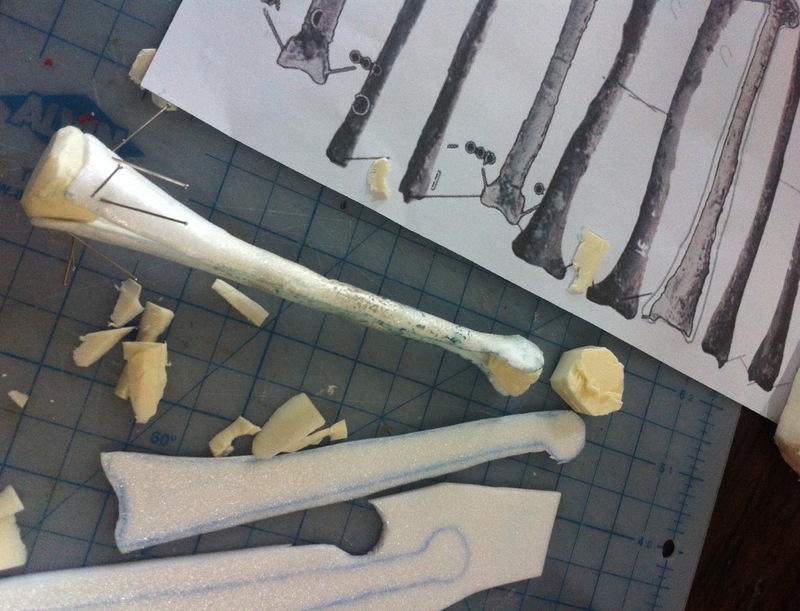 In fact I already had them all cut out and the haves attached before I did metacarpals and radius-ulna pairs. 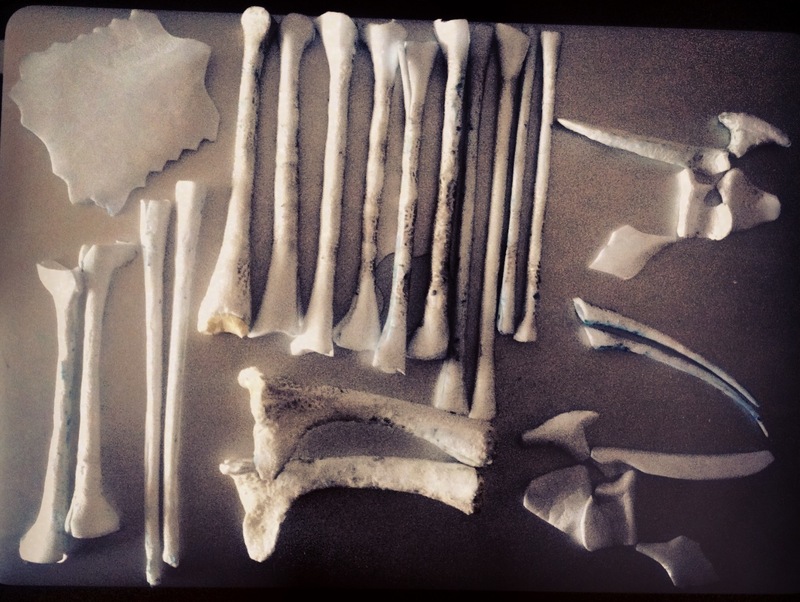 All these unfinished bones fit nicely on top my computer. 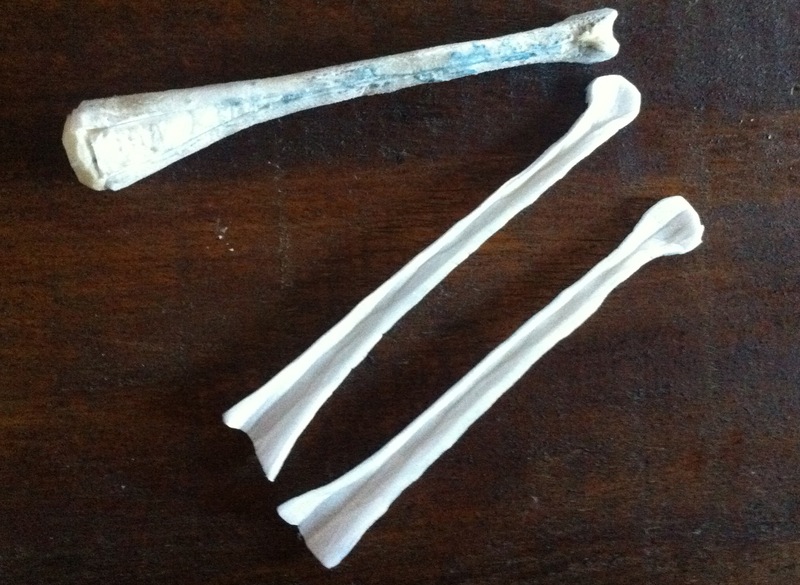 So I tested the wings before I made these bones. And here is the final result. 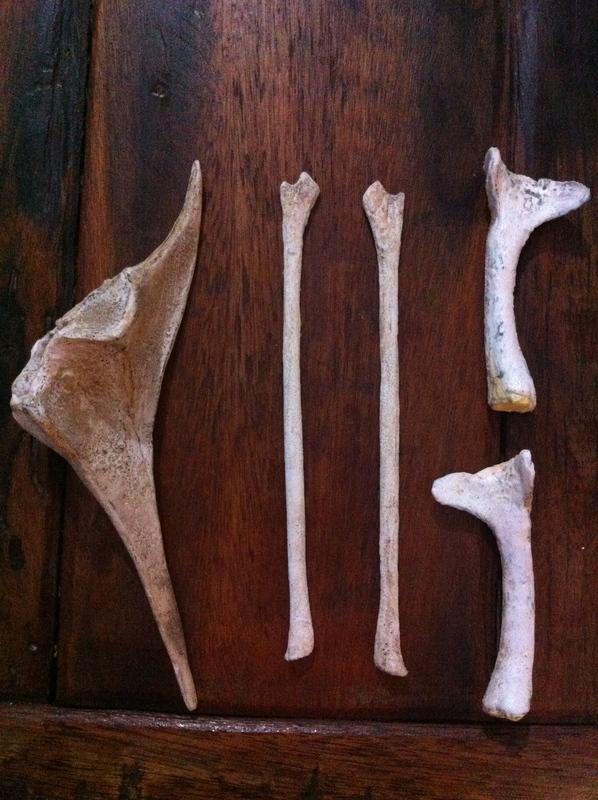 I used IMCF 1061 as sources for phalanges 2 and 3, and Tupuxuara for the last phalanx. I also used measurements from Brian Andres (scaled 25% as usual, since this is a larger specimen). Here is a detail of the last phalanx and articulation. And the full wing (I still hadn’t finished the humerus). 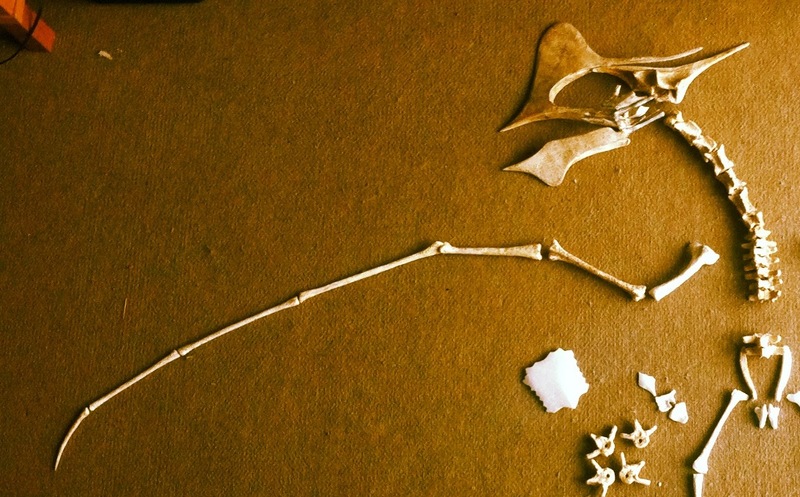 Now we can place the bones on a surface and imagine the full skeleton.